Directions: Read the summary, watch the video and answer the discussion questions below. Summary: When student journalists at Morgantown High School in West Virginia considered life after high school, they began to worry that they would have to leave their beloved home state to pursue their dreams. So they decided to explore the options by interviewing fellow students, economists and young people who seemed to be making a lot of money working on energy projects. West Virginia added more than 4,000 new construction jobs between January 2017 and January 2018, according to the General Contractors of America. 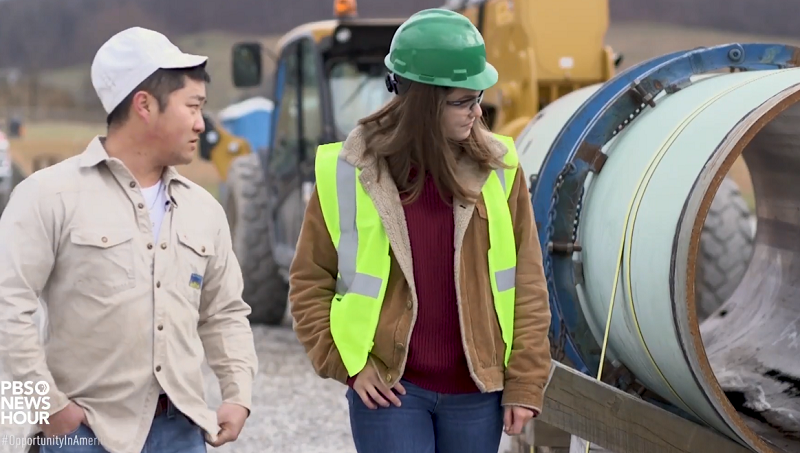 The Atlantic Coast Pipeline (ACP) project, a 600-mile line that carries natural gas through North Carolina, Virginia and West Virginia, has contributed to the recent boom in natural gas construction, but some residents and economic analysts are concerned the industry is only producing temporary jobs. Brittany Moody, the lead engineer on the ACP, says while only a few of the jobs will be permanent, the boost in the economy, even temporarily, is beneficial. 1. Essential question: How have natural energy projects like the gas pipeline impacted young people in West Virginia? 2. What are the concerns surrounding some high school students taking jobs in pipeline construction right after graduation? 3. What is upward mobility? What does economic opportunity in America mean to you? Do you feel like you will have to move to find the kinds of jobs that you want? 4. How do federal environmental regulations affect the development of pipeline jobs? How do these laws help protect the environment in the case of the ACP? 5. Media literacy: Research at least three other news outlets’ coverage of pipeline jobs in West Virginia. How many of them discuss the issue of young people not going to college in order to take a job on the pipeline? How could you find out more about the environmental impacts of natural gas development in the state of West Virginia? You may also want to take a look at more stories in NewsHour’s Student Reporting Labs’ “Opportunity in America” series. Teen journalists produced stories that explore dreams, expectations and the barriers teenagers must overcome to achieve their goals. The stories examine the tough choices and personal struggles that members of Gen Z are facing on the path to success, and the support systems that aim to prepare the most diverse and interconnected generation of our time. Directions: Ask your students to watch at least three videos and respond to the question: What are one or two factors that would help the students featured in the videos reach their career or life goals? Join NBC News Parent Toolkit and Share My Lesson for a webinar on social-emotional development.